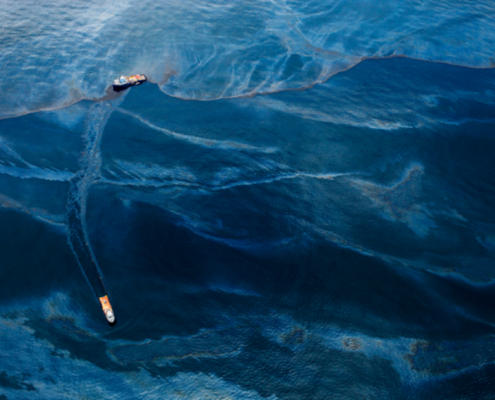 This talk develops a theory of the “fluid cut” based on the materiality of surfactants used to disperse oil during the Deepwater Horizon spill. Whereas photography theory tends to think of the “cut” as the click of a camera shutter that slices through moments in time, “fluid cuts” of surfactants like Corexit relate more to processes of diffusion in the medium of seawater. Through readings of photographic images by Daniel Beltrá and ads by the dish soap company Dawn, I show how surfactants are a literal example of what Charles Ackland names “residual media,” both left behind and viscous. From this perspective, Deepwater Horizon contributes to a notion of the Anthropocene that comes from chemistry rather than geology, with the implication that anthropogenic changes aren’t merely recorded in the geologic record, but actively reconfigure the chemical composition of environments.